Imer is a well established manufacturer of products designed to be utilised within the building trade, in particular the Imer scaffold hoists. With over half a century of experience you can be assured of great products which are up to the job. The robust gearbox is immersed in an oil bath to help prolong the working life of the hoist. The gears run particularly smoothly due to the helically shaped gears. The drum, on which the wire rope is wound, is situated traverse to the bracketed mounting frame. This enables even winding of the rope onto the drum and so helping to prevent the rope from accumulating on one side due to the supporting structures flexing under load. A further feature of the drum is that a special device ensures that two rope turns always stay on the drum. This gives higher performance and longer machine life because of eliminating the forces on the drum when trope is fully unwound. A range of power options are available with 210v to 235v available. 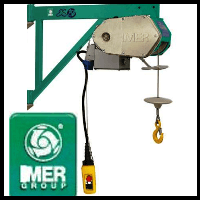 These scaffold hoists incorporate many features for extra safety assurance. These include: Positioning levers provide extra safety by eliminating uncontrolled movement and rotation of the load. Some models incorporate thermal overload protection for additional safety. Upper limiters are to prevent lifting to the maximum height. Neoprene covered cables for super protection against abrasive dust and other hazards found on construction sites. Need more information? Take a look at the individual product pages where you will find all the model specifications in detail. Need more help? Contact us using our rapid enquiry form of give our team a call on 01384 75182.